Noted for its attractive clusters of small, white berries, Snowberry (Symphoricarpos albus) is a small shrub with delicate branches. Quite frequently planted in hedges and as ground cover it hails from western North America. Left untrimmed, Snowberry can attain a height of 2m (6ft 8in). 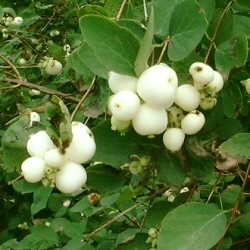 The Snowberry trees we grow are of the wild type and not the ornamental form meaning you will not get purple berries. We offer a range of tree shelters that will protect your plants and trees against possible attack. Click on this Tree Protection Link and it will take you to all of these products. Our Snowberry plants are sold as plug plants, in other words the roots are encased in compost. This means that planting can be carried out at any time of the year, provided they are watered in periods of drought, compared to bare-root plants which can only be planted during the plants normal dormant period (November to March). All of these trees are UK grown, which is important for successful establishment. See What Our Customers Are Saying About Our Snowberry Plants.